Director and producer Matthew Podolsky, co-founder of Wild Lens in Boise, ID, reached out and asked to interview me for his Long Trail series, which I happily accepted. Matthew host and produces the Eyes on Conservation podcast – a weekly interview series featuring top scientists, filmmakers and conservation issues from around the globe. 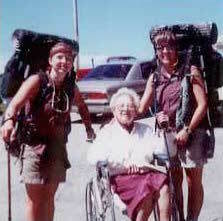 Cara Nelson, and her sister Amity Robichaud with their Grandmother Catherine Robbins Clifford during their 1997 Long Trail hike. He’s also a long distance hiker who has section hiked long stretches of the AT, and thru hiked the Long Trail with his mother in 2013. During his Long Trail hike he became fascinated with Vermont’s trail, and decided to produce a month long podcast series about the trail. He tracked me down through my website were he discovered that my son Carl and I were on the Trail the same time as he and his Mom. Listen as I share my grandmother’s stories, talk about my 1997 Long Trail thru hike and tell about adventures my son and I had as we section hike north on the Long Trail. 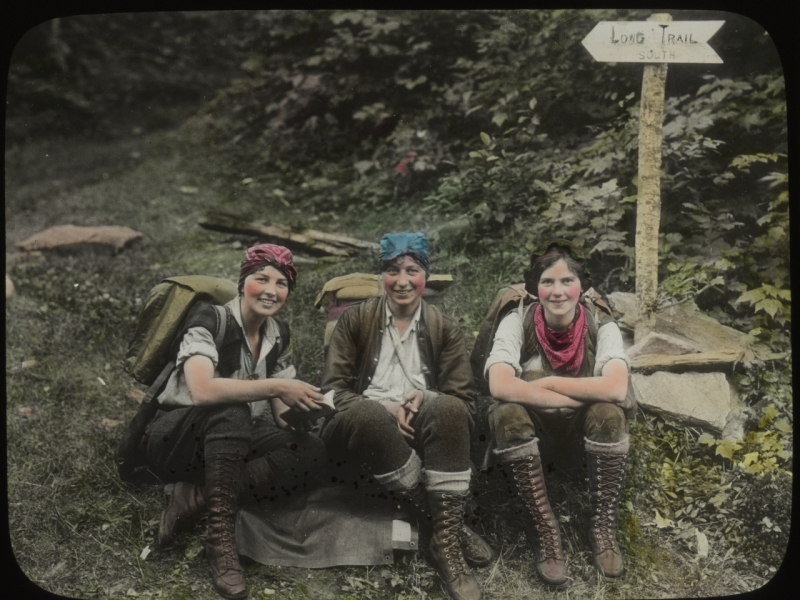 Hand-colored photograph taken by Theron S. Dean of the Three Musketeers on the Long Trail in 1927. From left to right – Catherine Robbins, Hilda Kurth, and Kathleen Norris. And here is a real treat and treasure as a very special BONUS episode of the podcast! Together with the Vermont Historical Society, I gave Matthew and Wild Lens, Inc. permission to air an archival interview with my grandmother Catherine Robbins Clifford sharing her 1927 Long Trail adventures and stories. The interview was recorded in 1987 for the Vermont Public Radio series “Green Mountain Chronicles”, but only a few short clips from Catherine’s interview were actually included in the 3-minute radio spot about the history of the Long Trail. For the first time ever, Matthew released a beautiful much more complete version of this historic interview – a full 45 minutes of stories and conversation in the voice of one of the very first women to hike the Long Trail, my grandmother. Listen and see what it was like in 1927 to hike the Long Trail, and discover what has changed and or stayed the same. Eyes on Conservation podcast engaging conversations about a vast array of wildlife conservation issues from all across the globe. A new episode is posted every Wednesday! Wild Lens a not for profit video production company focused on addressing wildlife conservation issues. More about the Green Mountain Chronicles radio series on the Vermont Historical Society website. The Green Mountain Club – the non-profit, established in 1910 by James P. Taylor, that continues to maintain the Long Trail.